There are spices OTHER than salt and pepper? This is a real mind-blower. Gustus Vitae, a California crafter of artisanal sea salts and gourmet spice blends, has compiled 12 pantry essentials: each one sustainably sourced, Non GMO Project verified, made in small batches, and hand-packed in unique magnetic tins that stick to your fridge, oven, hood, or BBQ, so everything you need to take your cooking to the next level is within easy reach. Our American-made magnetic tins offer myriad display options, and the unique rectangular stainless steel plate and included metal/wood screws mean that any part of the kitchen can be transformed into a complete gourmet salt and spice pantry. No nuts, soy, or gluten. Onion powder is one of the kitchen's unsung heroes - always there to help you with a dish, faster and infinitely easier than dicing onions, a trusted go-to to add layers of flavor, sweetness, and depth to you meals. We use American-grown onions, carefully dehydrating and mincing them to preserve their flavor, and carefully pack them in our tins so they're ready whenever you need extra depth and richness in your cooking. Our granulated garlic gives you the best of all worlds: unlike garlic powder, you can add it with oil to a hot pan and it won't burn, and it delivers on all the flavor of fresh garlic, conveniently accessible at the shake of tin. The cold, clean waters of the Pacific bring us our California Sea Salt. Sustainably harvested from Northern California, this pure, sparkling white sea salt lifts foods and drinks with it's clean flavor, while imparting all the goodness of trace sea minerals - it's the foundation of all great meals. Many things are excellent fresh: cut grass, sliced strawberries, your Christmas tree. Oregano, like many herbs, is not one of them. It's essential oils and flavonoids - the things that make oregano delicious - are actually concentrated and their potency increased when carefully dried. What that means is two things: 1) you can use less and get more, and; 2) what you do use is pure, concentrated, flavor. A lively blend of bold and zesty flavors, our authentic Garlic Pepper Rub adds full-bodied flavor to whatever is on the menu. Toss with salads, pasta, rice, and vegetables, or rub on meats, shellfish, poultry, and seafood prior to grilling for a spirited piquant taste. Our Garlic Pepper Rub is also wonderful as a marinade: mix a generous helping into a cup of soy sauce and allow food to marinate for three to four hours. Ingredients: California Salt, Garlic, Black Pepper, Red Bell Pepper, Parsley. Deep Alderwood smoke flavor and a mottled mahogany color define our Natural Smoked Sea Salt. Utilize its remarkably savory flavor on chicken, pork, potatoes, burgers, and add real depth to foods cooked on gas-fired grills. Its sparkling hazel color makes our Natural Smoked Sea Salt a beautiful finishing salt: sprinkle on foods just before serving for full-bodied flavor and a dappled luster. We've taken knowledge gleaned over centuries to bring the very best in paprika, grown naturally and sustainably here in the U.S.A. Our smoked paprika packs an unparalleled vibrancy, delivering both assertive flavor and bold color. And it's not limited to it's more traditional uses like in paella or frittata - you may know that paprika is a commonly used ingredient in Thai pad thai, or Mexican Mole Poblano sauces. Some of our favorite uses are with sweet dishes - lightly dusting a fruit salad for some added heat and vibrant color, added to a chocolate fondue for depth of flavor, or sprinkled on French vanilla ice cream for a truly international late night treat. It's difficult to write things about turmeric that haven't already been written. Ancient peoples have known for a long time the myriad uses of this very special herb, and here in the West, turmeric is finally being recognized as the healthy heavy-hitter it is. Sure - it's vibrant color will make your meals look beautiful and it's delicate flavors of ginger and orange will punch up your recipes, but what's even more impressive than it's culinary utility is it's bonus features. A delightful composition of savory, zesty, and sweet notes, Taste of California is a rich, flavorful blend of the natural bounty of California. Dried strawberries lend beautiful color and a lingering sweetness while the cilantro, thyme and tarragon add depth and warmth. The natural zest of the lemon peels bring a refreshing sharpness. Apply the Taste of California to fish, chicken, vegetable, and pork dishes prior to cooking-or sprinkle on fresh salads for vibrant color and complexity of flavor. Unless you're one of those unfortunates for whom this spice tastes like soap, we're betting that, whether you know it or not, coriander plays a role in many of your favorite meals. Coriander, or Cilantro as it's more commonly known in U.S., is culinarily agnostic - it's right at home in a spicy Indian curry, an authentic Mexican street taco, a summer pasta salad, savory coleslaw, Chinese stir fry, or atop your NY bagel with cream cheese. Our Crushed Red Pepper Flakes are carefully dehydrated and crushed into flavorful slivers, revealing all of the hot, sharp, perky flavors of red peppers. A necessary requirement for pizzas, use to liven up Mexican foods, add another dimension to broccoli and cauliflower, chicken dishes, fresh green salads, or just use to add flavor when trying to avoid seasonings with salt. 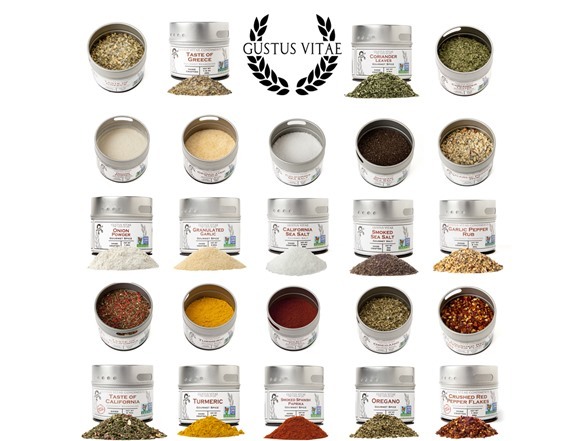 Gustus Vitae Condiments mission is to share the magic of cooking. Our name means ‘Taste of Life’ in Latin: we’re for getting the spices off the rack and onto your plate. For trying new things. For making food taste spectacular. What began as a small, inspired idea in the Venice Beach Farmer's Market back in 2011 turned into a company that elevates ordinary plates to signature dishes. We craft our seasoning blends and salts from only the finest of ingredients. We use American-made magnetic tins for our packaging, and print our labels on recycled paper. Non-GMO certified and never using harmful product-making chemicals, Gustus Vitae keeps quality at the forefront of all we do.